The History of Blackwood – Pioneer Doctors of Blackwood. Edward William Plews was born in London on 18 July 1822 and christened on 28th July 1822 at Westminster parish of Saint Clement Danes. (I.G.I. index). His parents were John and Margaret Plews. There were eight children listed as being christened in this parish, in the I.G.I. index to John and Margaret Plews. Edward Plews studied to become a doctor where he worked at Guys Hospital in London for a long period, and took his L.S.A. degree in 1848. 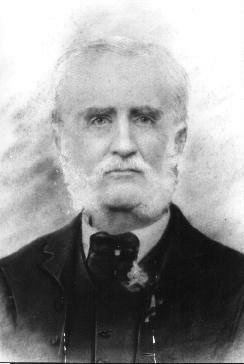 It is thought he came to Australia as a Ships Surgeon on the emigrant ship “James L Bogert” which landed in Melbourne April 27th April 1853. He practiced on the diggings for a while, then got an appointment with Dr. Preshaw to look after the men on the Castlemaine and Harcourt railway line. Whilst there he attended the farewell supper given to Bourke and Wills at Castlemaine in 1860. 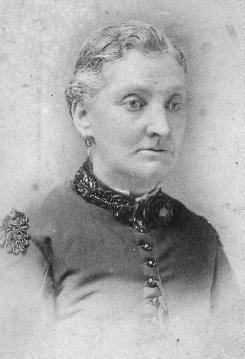 Dr. Plews married Mary Sandford Jones, October 1859 in Castlemaine, Victoria. A copy of his marriage certificate states Edward Plews as a Surgeon, age 37 yrs, his father John Plews was a Civil Engineer. Mary Sandford Jones was age 21 yrs, a spinster and born in Jersey in the Channel Islands in 1838 , her father was Nicholas Jones a Farmer, and her mother Mary Jones. Dr. Edward Plews arrived with his wife Mary Sandford Plews in Blackwood in 1861 and he was appointed Coroner, Deputy Registrar of Births and Deaths, and Vaccinator of the district. He held the first inquest on Blackwood, on a man and woman who were killed by a tree falling on their hut in Nuggetty Gully. Edward and Mary Plews had eleven children, the last eight having being born in the Blackwood area. Other information on the Plews family, came from Herb Cann of Blackwood; Herb Cann is the son of Herbert Holman Cann who married Eleanor Eliza Plews, the ninth born child of Dr. Plews. Their children were, Ida, died young, Lucy who married Ken McLelland and Herb Cann. Mrs Mary Plews, who the locals called Mrs. Dr. Plews after the death of her husband, Dr. Plews used to extract teeth by sitting on her patient, and pulling out the tooth. Dr. & Mrs. Plews lived in the house owned by the late Wally Sweet and his wife Barbara Sweet and family, next to the Blackwood Hotel. A room on the end of the verandah was his consulting rooms. Dr. Plews was said to have planted the dark pink rhododendron plant on the south side of the house against the wall facing the hotel. Wally Sweet found an old child’s wheelchair under his house, thought to have been owned by the late Dr. Plews which Wally donated to the Blackwood District Historical Society. On doing research into early inquests, I came across an unknown person who died in Blackwood and there was an inquest into the death. The inquest was dated 19th April 1866 and Dr. Plews was the doctor who gave a report on the deceased. His statement after he had examined the remains of the person who died stated – ‘I am a legally qualified medical practitioner, and a member of the Medical Board of Victoria practising at the Blue Mountain…’ and signed by Dr. Plews. Blue Mountain is now called Blue Mount and between Blackwood and Trentham. Copies of the 1888/89 Wise’s Post Office Directory have Edward Plews listed as a Surgeon of Mt. Blackwood, and the 1891/92 directory as Edward William Plews, Surgeon. Mary Sandford Plews is listed in the 1908 and 1912 Electoral Roll as a nurse, although I have no record of her doing formal nursing training. Her son Thomas Plews (Thomas St. George Plews) is listed as a miner in these electoral rolls. Tom Plews was said by Herb Cann, to also be a Coach Driver for the Cobb and Co. or the Royal Mail coach that came to Blackwood. 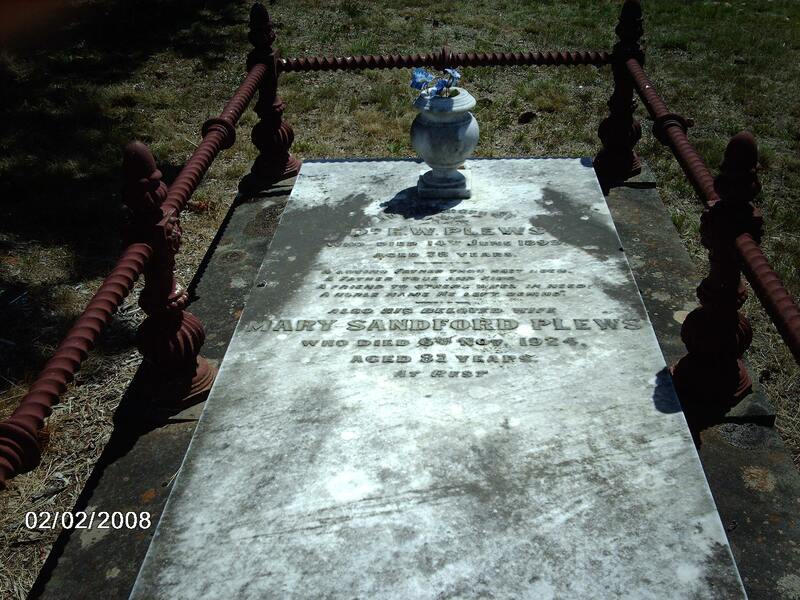 There were three children of Dr. Plews and his wife Mary who died at an early age. Their first child was called after his father, Edward William Plews, but died as an infant. Their second child was Arthur, who also died, then they had a child who they called after their mother, Mary Sandford Plews, who lived. The next child was also called Edward William Plews, and he lived to carry on his father’s name. The sixth child was Margaret Eleanor Plews but she died young and so the next daughter was also called Margaret Eleanor Plews. The house Dr. Plews lived in, was later owned by Dr. Plews youngest son, Thomas St. George Plews who sold the house to Walter Sweet and his family for 90 pound and then Thomas Plews moved to Trentham. After Walter Sweet died his widow Barbara Sweet lived in the house until 2010 when she sold it to move closer to amenities in Ballan. “I send you a few lines on the presentation by Mrs. Plews of her own and her late husband’s photo’s to the Blackwood Mechanics Institute, to be hung on the walls of that building by the committee. His widow is very kindly and skilful, and much appreciated by the people for her motherly care in attending to the troubles of children, and other minor cases, also first aid in all accidents, there being no doctor nearer than Trentham since Dr. Plews died.